Just back from 1,800 mile trip through Western Illinois, Eastern Iowa, Central Minnesota, and 200 miles north into Western Ontario. Here is what I know and some I don’t know. I do know that the fish were biting so that we ate beyond our rated capacity and still brought home our legal limits. I can also tell you that I saw some excellent crops, and I saw some bare ground that appeared to be ”prevent plant” but didn’t even have a cover crop. I got the WASDE report when I got back, and there were really no surprises. The acres were as reported at the end of June, and as I understand, USDA is not doing a new survey of corn acres. It is likely that the survey for soybeans missed the target when it was circulated in early June. Yields were basically unchanged, so you are faced with making decisions with very little new information, and what you have is questionable. Let there be no doubt, if the rains come, we are going to have some excellent corn yields. It would appear the crop has made up nearly three weeks of what was earlier described as 4-6 week delay. Weather during this next two or three weeks of pollination will be critical, as will the threat of an early frost. What I did see that might be a cloud over excellent yields was some fields with yellow patches beginning to show up. If that is lack of nitrogen, I think it will be the silent damper on what otherwise looks like an excellent crop. Now, on the other end, I saw bare ground, and I am told that similar or worse conditions exist as you go on west in Iowa. Like everyone else, my problem is trying to decide if that is half a percent, 5 percent, or something else. There are private estimates out there which I tend to believe are more accurate than the USDA numbers, but be cautious. It is very difficult and expensive to produce a scientific and reliable estimate. Not many private companies have those resources, so their “guesstimates” may be flawed as well. There are some indicators that point to lower acres, like seed returns, but those numbers are pretty tightly held. 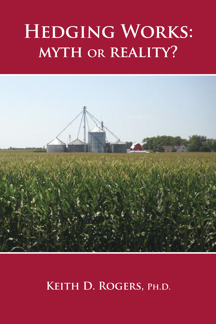 Farm visits and various reports provide anecdotal information, but are far from scientific estimates. Perhaps what surprised me was the market reaction to the USDA report. It is pretty clear that the market was trading a different set of numbers in expectation of USDA revisions. The surprise was that the market did not have more conviction and hold the line, but it is not uncommon for the market to buy the rumor and sell the facts. The futures market is about the unknown, and at the whim of a lot of cross currents. Confusing as it may be, it is a resource, and we have to learn how to use the information to our advantage. A quick review of the corn, bean, and wheat monitors reflect slightly different reactions to the USDA report. For more details about the monitors, see the previous articles about CZ13, SX13, and WZ13. Updating corn from the end of June, MA(17,35) gave up a little hedging gain but still leads the way with a net hedged position at $5.68, while the Close and MA(5) gained a little and now follows closely behind with a net positions at $5.63. For soybeans, the Close and MA(5) continues to lead the way with net hedged position of $13.28. MA(5,17) picked up some gain and now follow closely in second position with net hedged positions of $13.17. MA(17,35) continues to lead the way for wheat with an unchanged net hedged position at $8.55. The Close and MA(5) picked up a little gain, but still lags behind in second best position at $8.10. If you are new to charting, trend analysis, and hedging, I hope you are beginning to get a feel of how the various indicators work. With the spreadsheet templates for corn, soybeans, and wheat, everyone has the tools needed to track various indicators and sort out which ones fit your price risk management strategy best. I am still hearing talk of $4.00-4.25 corn or $6.00-6.25 corn (Dec contract). Likewise, I hear $10.50-11.00 beans or $15.50-16.00 beans (Nov contract). I can’t argue with those numbers because I can spell out acres and yield combinations that I think will hit all of those numbers. Being able to tell you what numbers will deliver what price is very different from being able to tell you if we will or will not have a rally (and I don’t know anyone who can), but a simple set of indicators is telling us if the market is moving off in one direction or the other. If you would like for me to explore a specific indicator which marketing advisors are using, please send along a note and I will give it my best shot. All comments and questions are welcome by Reply to the associated item on the Discussion page or through the Contact Us page on the website. Posted by Keith D. Rogers on 17 July 2013.